The final game of the 43rd National Championship of Japan Amateur Baseball Association (JABA) co-hosted by The Mainichi and Osaka City, and participated by 32 teams at Kyocera Dome Osaka on November 12, 2017 saw winning of TOYOTA of Aichi Prefecture for the fifth time in 3 years. 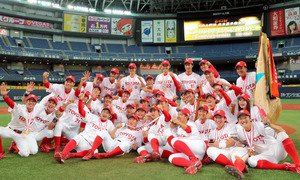 TOYOTA blocked NISSAY’s (Nippon Life Insurance - Osaka) attempt to claim the title for the fourth time, 3 – 1 by hanging on to changing 4 pitchers. A rookie pitcher Takumi TAKAHASHI (NISSAY) received Fighting Spirit Award, and Outfielder Hiroshi OHKI of TOYOTA was awarded MVP.